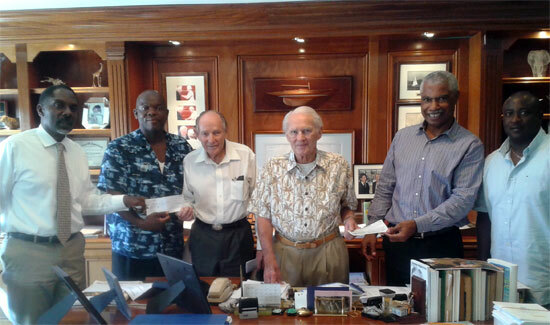 The Cat Island Sailing Club Association recently received donations from one of its founding fathers and a long-time member. Godfrey Kelly and Peter Christie continued the tradition of its annual donation to the Regatta. “When we started this in 1956, whoever thought 58 years later the Cat Island Regatta would be a staple on the calendar,” Mr. Kelly said. “From August 1st to the 4th, it’s going down in New Bight, Cat Island. We’re staging the greatest show on earth,” President Pat Strachan said. “This Year, patrons can look forward to a renovated Sailing Club including repairs to the male and female bathrooms, newly installed air-condition units and new windows.” President Pat Strachan continued. Peter Christie, Godfrey Kelly, President Pat Strachan & Past President Samuel Smith.